Tomorrow, New York City’s Park Avenue will be turned into a cyclovia. Photo by Asterix611. Tomorrow, seven miles of Manhattan’s Park Avenue, stretching from the Brooklyn Bridge to Central Park, will be filled with people, not cars. For three Saturdays every summer, as part of the annual NYC Summer Streets, New York City turns Park Avenue over to pedestrians from 7 am to 1 pm. Instead of the usual gridlock of cars, the street will be filled with cyclists, rollerbladers, walkers, and picnickers. Part block party, part bike path, the route will include opportunities to view art exhibits, climb a rock wall, and even take a ride on a zip line. New York is not alone – cities all over the world, from Bogota to Paris occasionally invite residents to enjoy the full use of major roads on foot or by bike. Though temporary, these street closures are a great way to return the city to its residents. They help to get citizens outdoors and active, and – hopefully – change the conversation about public space. Just who came up with this? These radical, wonderful street closures all started in Bogota, Colombia, where the popular “Ciclovia” now occurs every Sunday and on holidays. Once a week, over 121 km (75 miles) of road are turned over to cyclists and pedestrians. In Bogota, they aren’t closing the streets – they’re opening them. Almost 2 million Bogota residents – 30% of the city – take part in free exercise classes and the opportunity to travel the city safely. The program has been growing in popularity, but it isn’t new – in the late ‘90s, Gil Peñalosa, Bogota’s former Commissioner of Parks, Sport and Recreation, instituted this model program, along with the help of his brother and then-mayor Enrique Peñalosa. Gil now travels the globe encouraging other cities, like New York, to follow Bogota’s lead. 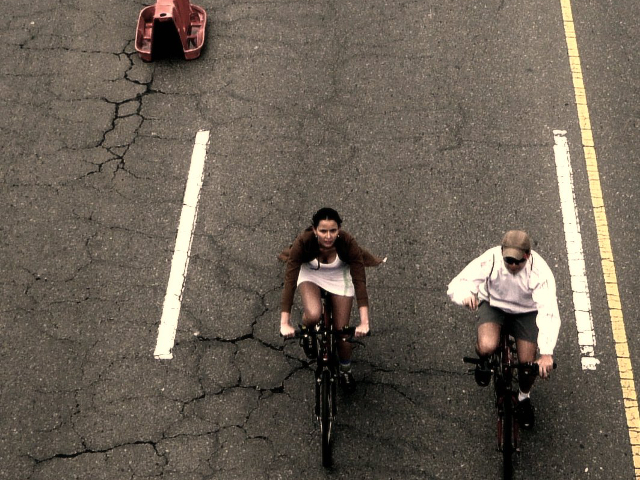 Every Sunday, Bogota turns 70 miles of road into the world’s largest Ciclovia. Photo by TheFutureisUnwritten. And many other cities, in both developed and developing countries have followed suit. Lima, Peru turns its major Avenida Arequipa into a Ciclovia every Sunday. Argentina, Ecuador, and Mexico have all instituted similar Ciclovia programs, though none so far have as many kilometers of road dedicated to the project as Bogota does. In the U.S. many cities have instituted occasional car-free streets. Like New York, these are often dubbed “Summer Streets” and only take place a few days every summer. Paris takes a whole different approach to minimizing the disruption of car-free streets – cars are forbidden from the Pompidou expressway along the Seine for one month every summer. This allows more permanent structures – like a temporary beach known as the “Paris-Plage” and small shops to be installed along the pedestrian summer paradise. 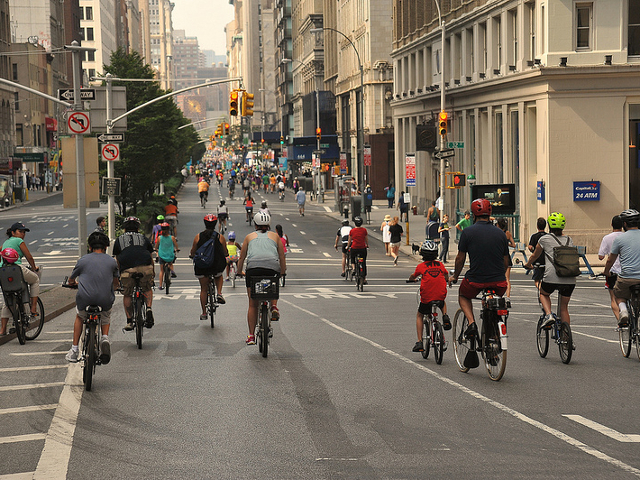 The New York Department of Transportation’s website for NYC Summer Streets explains that streets are “New York City’s most valuable public space” – and they’re right! During NYC Summer Streets in 2012, more than 250,000 New Yorkers enjoyed the newfound public space. In Bogota, where 2 million residents enjoy classes, rock walls, and the opportunity to run, walk, cycle, and play, the roads really are making a difference in public health. Getting citizens out of cars and out of doors is essential in an age where the car-reliant layout of our cities is causing obesity and health problems. Fans of Bogota’s Ciclovia often point to the power of these car-free days to enrich community life as one of its great advantages. Those who partake in Ciclovia, and similar programs around the globe, often find that they have conversations with strangers that they wouldn’t have had otherwise. After spending a day participating in community workouts and sharing the public space with so many fellow city-residents, many realize the car can be distancing. People are more willing to interact with each other on foot. When roads are freed from cars, stronger, healthier communities result. While getting citizens active and engaged is a great result by itself, there is something even more powerful in these temporary street closures: they have the ability to change the conversation about public space and car reliance. These roads, this space, which in every city is occupied by cars, need not be. It is a choice to dedicate public space to large, personal vehicles that pollute with noise and exhaust. It’s true, buses and taxis use the roads as well, and the street closures disrupt deliveries, and may worsen traffic for those who still choose to drive. But when 250,000 of New York’s citizens pour into the streets tomorrow, it will be hard to argue that the road isn’t being used fully and productively.